The cockroach is a resilient little beast, and it turns out they also have the proverbial jaws of death. They can bite with a force 50 times stronger than their own body weight, and with five times more force than a human being. That’s the conclusion of a new paper in the journal PLOS ONE by researchers at the University of Cambridge, who measured the force behind 300 roach bites. This is a surprisingly active area of research: scientists have measured the bites of lots of large vertebrates, for instance, plus a few crustaceans for good measure. 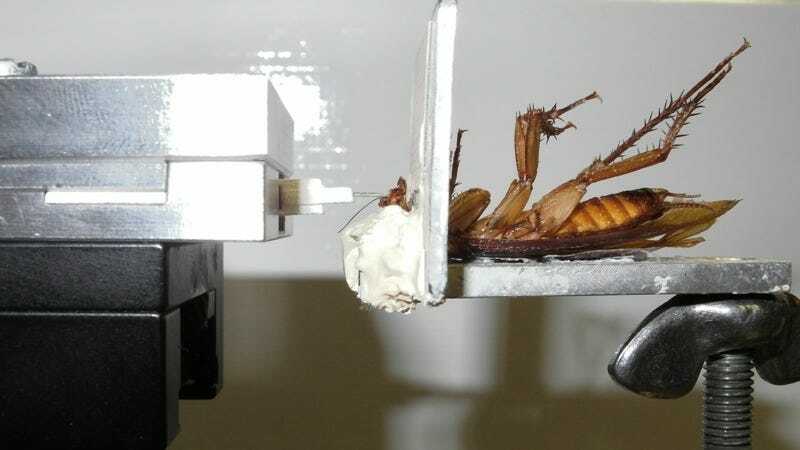 But this is the first such study to measure bite forces of ordinary insects, according to lead author Tom Weihmann. Weihmann and his colleagues started with ten adult cockroaches, although they lost two specimens after their teeth broke off during particularly intense biting. The animals were sedated by, essentially, refrigerating them briefly, and then mounted on their backs on an aluminum holder (see top photo). There was a notch around their throats to keep them in place, and the sedation prevented them from waving their little insect legs too much. The scientists used dental cement to glue the insects’ heads to the aluminum holder. Then they just let the roaches bite away. The 300 bites were duly measured, and then “specimens were sacrificed by freezing for several minutes,” the authors write. They found that the bites varied in force, from short and weak, to strong long-basting bites, depending on what material the roaches were chewing on. For tough things like wood, lots of high-force chewing was required. But roaches have limited space in their buggy heads for there to be much room for bulky muscles to operate those scissor-like jaws. Where does all that force come from? The Cambridge scientists found that roaches use a combination of fast and slow twitch muscle fibers when they need to chow down on tough materials. “These slower muscle fibers give the mandibles a force boost to allow them to exert up to 0.5 Newtons during sustained grasping and chewing,” Weihmann explained. That’s a thought that should keep you up at night, lest one of these little buggers decides to chomp on you as a late-night snack. It’s just one more reason why cockroaches will probably inherit the Earth. Weihmann, Tom et al. (2015) “Fast and powerful: Biomechanics and bite forces of the mandibles in the American cockroach Periplaneta americana,” PLOS ONE 10(11): e0141226P. Images: Weihmann et al/PLOS ONE.